WASHINGTON (CNS) — Although Catholic leaders vowed to fight on, the Obama administration has turned down repeated requests from Catholic bishops, hospitals, schools and charitable organizations to revise its religious exemption to the requirement that all health plans cover contraceptives and sterilization free of charge. But Cardinal-designate Timothy M. Dolan of New York, president of the U.S. Conference of Catholic Bishops, said the Obama administration had “drawn an unprecedented line in the sand” with the decision. 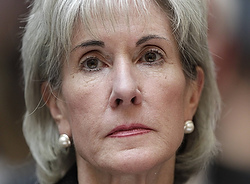 Sebelius announced the mandate and a narrow religious exemption to it Aug. 1, 2011. Under the plan, after Aug. 1 of this year, new or significantly altered health plans will be required to provide all FDA-approved contraceptives, including some that can cause abortions, without co-pays or deductibles as part of preventive health care for women. The only religious organizations exempt from the requirement would be those meeting four specific criteria — “(1) has the inculcation of religious values as its purpose; (2) primarily employs persons who share its religious tenets; (3) primarily serves persons who share its religious tenets; and (4) is a nonprofit organization” under specific sections of the Internal Revenue Code. Those sections “refer to churches, their integrated auxiliaries, and conventions or associations of churches, as well as to the exclusively religious activities of any religious orders,” according to a footnote to the interim final rule. Catholic groups, including the USCCB, the Catholic Health Association and Catholic Charities USA, called that exemption too narrow, saying it would require Catholic groups to stop all services to those who were not Catholic and would inappropriately involve the government in decisions about whether an organization is “religious enough” to be exempted. Sebelius’ announcement brought an outcry from Catholic leaders and a sigh of relief from groups such as Planned Parenthood and NARAL Pro-Choice America, which had opposed any moves to weaken the contraceptive mandate or strengthen the religious exemption. In a video posted on the USCCB website, Cardinal-designate Dolan said the decision put the Obama administration “on the wrong side of the Constitution” and should be rescinded. Father Larry Snyder, president of Catholic Charities USA, said he was “extremely disappointed” that the administration chose to ignore calls from religious institutions to broaden the exemption. “With the existing restrictive definition in this mandate, the ministry of Jesus Christ himself would not be considered a religious entity,” he said. It seems perfectly logical to me; if you are a Catholic institution and you serve Catholics, you are protected by the US Constitution and you can impose any restrictions you want to while if you serve non-Catholics, you have to follow government regulations which apply to the general public. It appears, Robert, that you fail to understand Christian faith beliefs held not only by Catholics but also others such as the Southern Baptist Convention, that our faith calls us to serve the needy regardless of the faith of those we serve. Both of these Christian groups, and other Christian entities too I am quite certain, serve others in the name of Christ first. Their need is foremost. For Obama’s HHS to deny this service is to deny the free exercise of freedom of our religion.